Proper body preparation on the recovery is critical to the catch and drive. The hands should lead the arms and back forward so that the back is upright and perpendicular. When the hands pass over the knees, the legs begin the slide as the back swings forward into the angle required at the catch. To stop from lunging at the catch, set your body angle when the hands are over the toes, as the blade begins to square. The legs should then continue into the catch with the forward body angle set until the blade enters the water. If the upper body continues to swing forward into the catch, the hands may follow the back downward, sending the blades away from the water. Those who lunge at the catch also risk initiating the stroke with the back rather than the legs, which could result in a weaker drive. Setting the body angle early and holding it until the start of the drive will help ensure that you load the blade with the legs and core—your strongest muscles groups. Note the head positions of Australians’ Drew Ginn and Duncan Free. Focusing on the horizon will alert you to lunging when you head drops because the back is continuing to swing down. 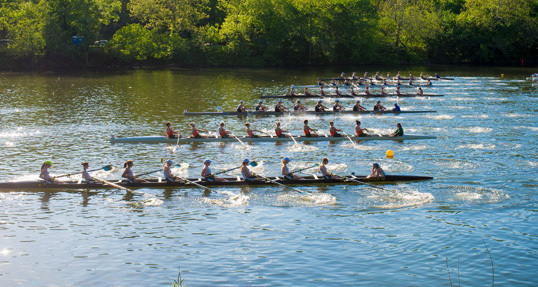 Both rowers are sitting tall, even though their backs are in the forward body angle. At the catch, their arms are extended, but not locked. Shoulders are square rather than rounded. With equal hand levels, the boat is more likely to be set and run straight. With their legs fully engaged, the arms and back help transfer the leg drive to the end of the oar.